One of the biggest challenges that global life science organisations have to overcome is managing the creation, re-purposing, promotion, and distribution of content as a plethora of new and more dynamic channels become available. Effectively managing this array of digital assets is becoming even more necessary in today’s business world, which demands an unprecedented level of governance and control. Huw Jenkins, senior solutions consultant for digital asset management at Veeva, discusses the key benefits for implementing a Digital Asset Management (DAM) solution. 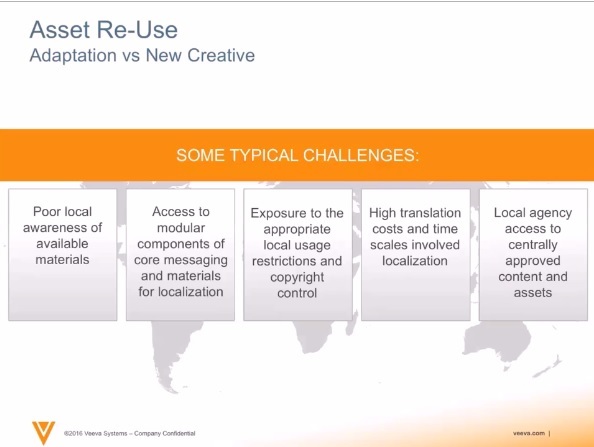 One of the core challenges for any global company is encouraging asset re-use and more consistent global messaging. This tends to be borne from the lack of corporate ownership of the native promotional materials and their digital assets limiting the business’s ability to share the content across the global landscape. Implementing a DAM is the most significant step to solving this problem: allowing companies to own their content. Unlike days of old, digital assets are no longer just documents and files. Instead, they are digitally-rich, high-end assets that cannot be just simply uploaded to a SharePoint or on a server. Businesses today need an environment to support the complexities of these assets to effortlessly promote their values without the need for any high end software the agencies may have used to create the asset. With a DAM solution in place, original asset formats can be viewed and shared across an organisation from a central repository, encouraging asset re-use by making them accessible, viewable or playable. This improves consistency in brand messaging as assets are re-purposed rather than re-created. The re-use of content can allow for big savings to be made in both time and production costs through the avoidance of unnecessary asset creation. However, often just making assets available alone isn’t always enough. Local affiliates and or regional hubs may be reluctant to adapt central materials if they are not sure if they can actually use them. And HQ may be reluctant to share if there are no controls in place to manage copyright. Aside from visibility, the effort required to adapt rather than re-create, such as the cost of translation, is often cited as a major contributing factor as to why materials are re-created rather than simply adapted. A DAM implementation can remedy these issues, ensuring access to materials, setting limits on when they expire, and giving visibility to where assets are being used. Aside from usage rights, it’s important for the modular components such as any photography or logos required for re-use to be easily available, meaning that if the product name is different from region to region, these modular components can be disseminated and related to the assets. Relating translation text to the asset also helps, along with ensuring that any already existing country versions are clearly available. For example, someone from Mexico can see a Spanish version that already exists and can in confidence re-use it quickly which improves efficiency. The sharing of campaign toolkits, jobkits, component packages, and other asset collections means local affiliates have everything needed for localisation and re-use. However, the sharing of materials in global space doesn’t have to be without governance. Workflows can be applied to ensure access to more copyright-sensitive assets can be vetted by the business whilst ensuring the local affiliates always have visibility to what is available. With an absent single source of truth, and endless barriers to re-use, marketing teams will often find it difficult to distribute their digital assets quickly and efficiently, which can have a major impact on brand loyalty as their competitors arrive to market before them and reduce their selling time. Extensive time can be spent up stream, bringing teams together in the ideation process with materials that are difficult to find, disconnection between the review and approval process, and finally when the idea is eventually approved. Cascading it to regional and local hubs takes an enormous amount of effort before content has even been made available to multi-channel sources. With a good DAM in place, content and assets become available to all relevant parties in a centralised and easily searchable form, allowing for a quicker distribution across geographically-distant parties. As life sciences companies are dealing with their source files (and not renditions) they can connect this all to their multi-channel end points such as web sites, print houses and eDetailers. Closing the gap between what is approved and what is managed and distributed is a common challenge in life sciences, perhaps more so in this industry than any other. In the PMCPA case AstraZeneca vs Chiesi, we see a breach in code of practice when what was approved by the signatories differed as to what was actually printed and used. Ensuring that the DAM solution provides a single source of truth through the digital supply chain must be seen as a necessity in any DAM RFP in Life Sciences. The review, approval, sharing and distribution process must be based on the same asset – the life sciences industry cannot afford any breaks in this chain. Providing analytics and metrics on the effectiveness of key campaigns is critical for making important business decisions and for future planning. Businesses need to know where assets are in use and how they are performing. Maintaining relationships between assets is paramount as they are copied and localized in order to truly report on their effectiveness. This can’t be achieved without a DAM as a single source of truth that ensures traceability throughout the complete digital supply chain. In today’s rapidly evolving business ecosystem, DAM implementation is definitely becoming essential. 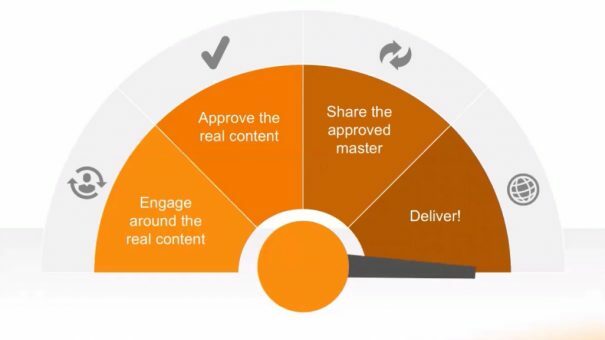 The provision of a single source of truth not only aids in collaboration and content management, but it also helps save huge amounts of time and money, prevents gaps in the process from content production to market distribution, and reduces compliance risk. With so many advantages to DAM implementation, can you afford to ignore it? To learn more, watch the on-demand webinar.